Alabama Senate candidate Roy Moore says “dirty politics” are behind the allegations of sexual misconduct against him. After speaking Monday night to a friendly crowd in northeast Alabama, Moore lashed out at the allegations as false but would not take questions from reporters. Moore has been accused of sexually assaulting or molesting two women decades ago, when he was in his 30s and they were teenagers. At least five others have said he pursued romantic relationships when they were teenagers. The Republican told his supporters that establishment leaders of both parties oppose him because he is “hard to manage” or they want to stop his religious-themed politics. Moore said he hopes to one day outlaw abortion. 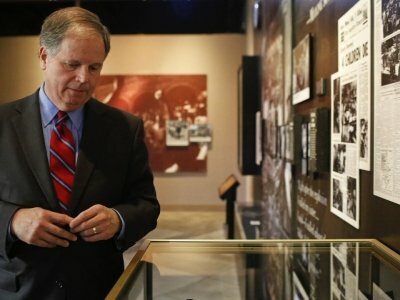 Democrat Doug Jones does not support new restrictions on abortion rights. A White House spokeswoman says President Donald Trump is too busy to visit Alabama to support embattled Republican Senate candidate Roy Moore. Sarah Huckabee Sanders told reporters Monday that Trump will not campaign in advance of the Dec. 12 special election because “his schedule doesn’t permit” it. Moore is facing accusations that he sexually assaulted or molested women decades ago, when he was in his 30s and they were teenagers. At least five others have said he pursued romantic relationships when they were teenagers. Trump has all but endorsed Moore, pointing out that Moore denies the accusations. Moore is facing off against Democrat Doug Jones in a Dec. 12 special election to fill a seat held previously by Attorney General Jeff Sessions. A White House official says President Donald Trump will not campaign for Republican Alabama Senate candidate Roy Moore before the Dec. 12 special election. The White House official told The Associated Press that Trump would not travel to Alabama on Moore’s behalf. The official was not authorized to discuss the president’s plans publicly and spoke on condition of anonymity. Republican Alabama Senate candidate Roy Moore is using a new television ad to push back on allegations of sexual misconduct against him. In the new ad, an announcer says Moore is being hit by “false allegations” in a “scheme by liberal elites and the Republican establishment” to sink his candidacy for U.S. Senate. The ad does not describe the allegations against the 70-year-old Moore. Two women have accused Moore of sexually assaulting or molesting them decades ago, when he was in his 30s and they were teenagers. At least five others have said he pursued romantic relationships when they were teenagers. Moore has vehemently denied the allegations. He is facing off against Democrat Doug Jones in a Dec. 12 special election to fill a seat held by Republican Jeff Sessions. President Donald Trump came to the aid of embattled Republican Roy Moore by criticizing Doug Jones, the Democratic nominee in the hotly contested Alabama Senate race. In a pair of Sunday tweets, Trump said it would be a “disaster” for a Democrat to win the Dec. 12 election. The president’s words could be a boost to Moore. Two women have accused Moore of sexually assaulting or molesting them decades ago, when he was in his 30s and they were teenagers. At least five others have said he pursued romantic relationships when they were teenagers and he was a prosecutor. He’s denied the allegations. Moore quickly touted Trump’s words on social media and in a fundraising appeal to supporters. Jones’ campaign said Moore was “unfit” for office even before the allegations surfaced.